Discover our selection of best selling wholesale confectionery products including Haribo, Swizzels Matlow and more! This section allows you to find out what's popular and what like minded businesses are buying. With over 95 years experience in the wholesale industry we know just how much your customers love their confectionery, which is why we stock an extensive range of best selling wholesale confectionery. Haribo, Swizzels Matlow and Other Leading Brands.. Within this range you’ll find wholesale confectionery from some of the industries most reputable brands including Haribo, Swizzels Matlow and Maoam. Catering for businesses with varying confectionery requirements our range of best selling wholesale confectionery includes 1p sweets like Apple & Custard Hearts, Cherry Cola Bottles, Juicy Lips, Fizzy Blue Bottles and more. 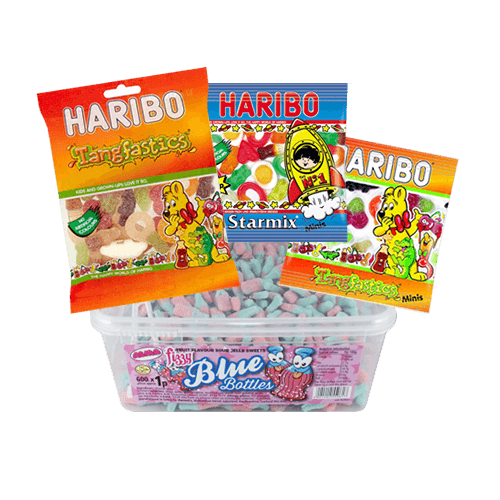 Our range of best selling wholesale confectionery features a variety of Haribo’s famous 10p mix mini bags available in the classic Starmix, Supermix and the much loved Tangtastics. For those looking to offer a bit more variety on their pick ‘n’ mix counter we stock Maoam Stripes 5p. As a leading suppler of wholesale confectionery we offer next working day delivery and 10% off all first orders. We also take great pride in offering exceptional customer care. So if you’d like more information on our range of best selling wholesale confectionery then feel free to give us a call on 01254 306840.